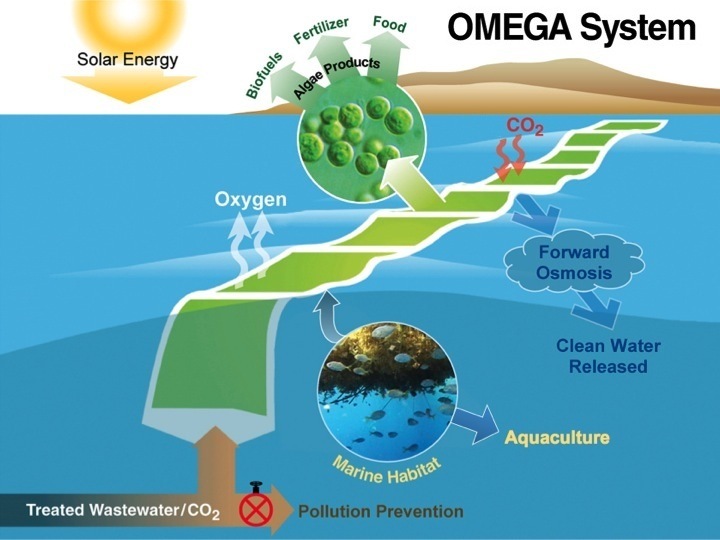 Project OMEGA – Offshore Membrane Enclosures for Growing Algae – was developed by NASA to clean wastewater and produce biofuel in the process. Jonathan Trent leading the project is a big believer in microalgae’s multifunctional benefits in environmental and economic terms. He poignantly reminds us “we are not passengers on spaceship Earth, we are the crew” quoting Marshall McLuhan. The OMEGA system pumps wastewater and a source of CO2 into a floating container. The wastewater provides nutrients for the algae to grow. The algae sequester CO2 producing oxygen instead of releasing it as a greenhouse gas. 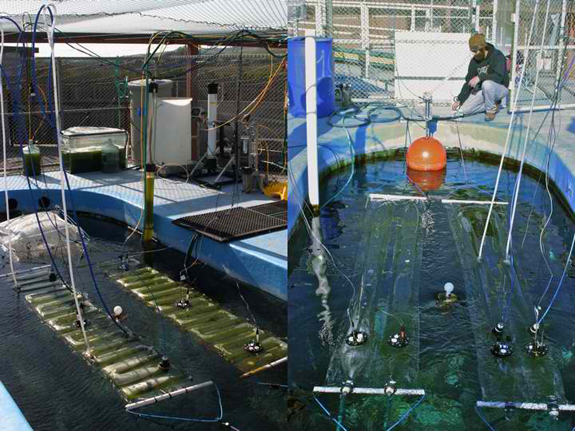 Solar energy helps the algae growth, wave energy on the surface mixes the algae, and the temperature stays controlled by the surrounding water temperature. In addition to creating oxygen, the algae produce biofuels, fertilizer, animal feed and other bi-algal products. The structure consists of large flexible plastic tubes floating in seawater. The tubes are called “photobioreactors” and contain freshwater algae growing in wastewater. Model of the system above water. Model of the system under water. The graph below shows the different types of crops used to make biofuels. Microalgae can produce 2,000 to 5,000 gallons per acre each year, in comparison to the 50 gallons produced by soybeans per acre per year. Currently cities around the world process or simply release their wastewater off shore, as depicted below. Wether processed or not, the wastewater is great for growing microalgae, while the algae remove nutrients from the wastewater that otherwise would contribute to “marine deadzone formation.” They can also help clean the wastewater to be reused as a valuable fresh water resource. The system is modular, designed to be fail proof. Even if one container leaks, it can be fixed without disrupting other modules, and the enclosed fresh water algae can not survive in the surrounding salt water if they leak out. You can also listen to a NASA podcast interview with Trent here: audio podcast here. Algae Systems is a working example of utilizing this technology and is currently looking for partnerships. Please feel free to share here any information about development and application of this technology around the world.